I’d like to tell the story of my great grandfather William Battle, who is on my mothers side of the family. A few years ago, I became interested in doing my family tree, having left it too late to ask my grandparents (who I didn’t get to know very well) or my mother who died young, so everything I have found out (with help from my husband) has been through my own efforts. My earliest memory of him being mentioned was on one of our monthly visits to see my great grandmother Elizabeth Jane Battle and my great aunt. I was around 4/5 years old, and my mother told me that my great grandfather had been blown up (yes she did use those words) while on guard by some water works gates during WW2. Although this was a shocking piece of info to give, it meant little to me at that very young age, did not have the ability to understand what it all meant but never forgot being told. I didn’t even know his name. William Battle was born in 1879 in Blunham, Bedfordshire, many families with the Battle name originated from there, there is even a Battle Cottage, in Blunham. He came to London at an early age, and met my great grandmother, Elizabeth Jane Dimond. They had six children, the second being my grandmother (Edith Maud Battle), the three youngest died very young of TB (Tuberculosis) I believe something else my mother told me. In the 1930’s they moved from London down to Kenley. During my research I quickly discovered that he was mentioned on the Roll of Honours list, this is when I found out that he had been a Platoon Commander in the Home guard 58th surrey regiment. After more research and archive visits we found out that he had been on duty, not on the actual airfield as originally thought, but at Kenley waterworks close to where he lived, Pyrford, Bourne View on the 18 August, 1940, he was on duty by the waterworks, when the first wave of attack began. He was hit by shrapnel from the bombing raid and killed on what was known as The Hardest Day. He was 61. The nature of his death is explained in one of the books below. 3. Village Histories 6 Kenley – The Bourne Society on Page 68 near the bottom there are a couple of lines about his sad death. One more fact was his son, my great uncle Arthur William battle was a pc for many years in London and Kenley/Warlingham area. He was on duty that day, and made a check on his parents & sisters home, to be told their father had just lost his life, he went down to works nearby to find his fathers body under a blanket. My great uncle wrote his memoirs as a pc. 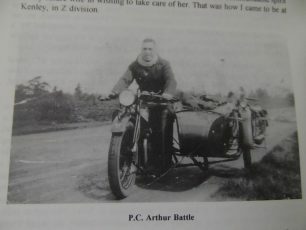 There is an article by PC Arthur Battle himself in Bourne Society Local History Records No. 36, 1997 pages 3-13.